Soft matter includes a wide range of materials that flow or experience deformation when exposed to stresses or forces. Colloids, polymers, vesicles, and bubbles are a few examples. The relationship between the magnitude and duration of the ‘deforming’ force gives rise to unique and dynamic material properties. Understanding and mastering these properties are main areas of intensive research. For a few years now, I’ve been helping organize and promote the soft matter research community of the University of Puerto Rico – Mayagüez (UPRM). More than 20 professors are identified as researchers in this multidisciplinary field. My colleague Dr. Patricia Ortiz and I took first steps in this direction in the spring of 2014. Our plan was to bring this community closer through a NSF REU program. After hard work, the proposal was accepted and this summer that just ended we had our first cohort. In spite of very little time to promote the REU site in Reconfigurable and Multifunctional Soft Materials, more than 80 students from all over the US applied to our program. After careful evaluation of the applications, 11 students were selected from the following academic institutions: Stanford University, Carnegie Mellon University, University of Wisconsin – Madison, UPRM, Kennesaw State University, North Carolina Agricultural and Technical State University, and East Los Angeles College. The participants embarked in a journey into an exciting network of opportunities and experiences. The research activities of our REU site focus on: (i) synthesis, characterization, and modeling of particulates (encompassing length scales from nanoparticles to grains) resulting in novel behavior at the macroscopic scale and (ii) characterization and understanding of how biomaterials operate where structure or modifications result in novel functionality. The educational seminars planned for the summer gives the participants a clear sense of what research is and hopefully motivate them to pursue graduate studies. This REU site provided the students a broad experience of the soft matter field and helped them identify the interconnected properties and features that make these materials relevant for emerging needs and applications in nanotechnology, bioengineering, and the industry. The students learned from their mentors how the deformation of materials with multifunctional and/or reconfigurable properties correlates to their fundamental composition and structure. This understanding is key to properly place in context the operative forces that govern these materials at different length and time scales and acquire a necessary training to continue finding underlying principles that connect them. Results gathered from informal and formal assessment of the program show that the REU participants gained significant positive skills during the summer to become better researchers and the motivation to pursue graduate school. On a personal note, I’m happy that the REU participants had many opportunities to enjoy our beautiful landscape and to learn from our culture and history. Puerto Rico offers so many good things that sometimes locals forget they exist. 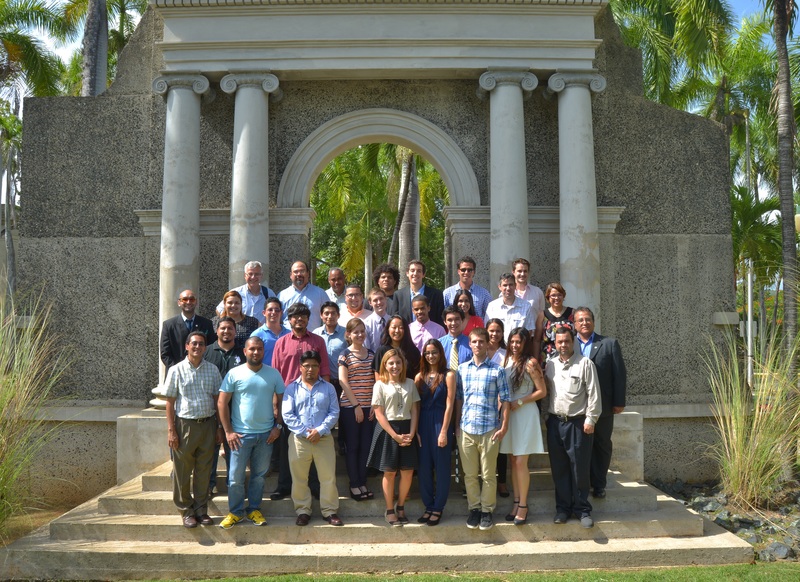 It became very clear from the planning stages of our REU that the combination of a culturally rich location like ours, a meaningful research experience at UPRM and a thoughtful training in research and scientific communication provides the best experience one can hope to obtain as an undergraduate student fully committed to a career in STEM. I would like to thank all the students, mentors, professors, staff and collaborators involved with this effort. In a few months, we would start promoting the program for our second cohort – summer 2016. Stay tuned for details and updates at softmatter.uprm.edu. I see the summer as my time for reading papers, organizing for a challenging upcoming course, and working with graduate students on manuscripts. I believe that this “renewal time” is very important for a researcher and for this reason I have never taught a course in the summer. I look back at summers where this renewal was the key to successful research grants, and others that were essential in developing a new course. These thoughts bounced back and forth through my mind when I first listened to Dr. Ubaldo Córdova describe his ideas for an NSF proposal on research opportunities for undergraduate students in the area of soft matter (REU). I was happy to learn about his dream of improving research on our campus, but at the same time concerned that this would take some time away from my summer plans. I agreed to support the program but not as active researcher, by providing a talk on writing skills for scientific communication, and some support funding through our Sloan Program of Exemplary Mentoring which is also focused on encouraging students to advance to graduate studies. The REU proposal was approved and one of the students selected indicated his interest in working on near infrared spectroscopy, the area of expertise of my research lab. We were able to include this young researcher in our group plans and have one of my most memorable, happy, and productive summers. Fortunately, during the last year we have developed a research project within our Engineering Research Center for Structured Organic Particulate Systems (hppt://ercforsops.org) that involves all graduate students in our research group and Dr. Rafael Méndez from the Chemical Engineering department has also joined this effort. Four graduate students worked with Jacob Townsend, from Kennesaw State University, who will be completing his B.S. in Chemistry this next December. Jacob worked on a set of experiments in this group project, and very quickly understood the theoretical background and importance of the research. Our research involves analyzing pharmaceutical materials in the solid state. Jacob first worked with an experiment that we have designed for training new students, which helped him in understanding the physics related to the scattering of radiation. He also grasped very quickly the multivariate analytical methods (chemometrics) that are based on linear algebra and careful evaluation of near infrared spectra. Jacob attended the IFPAC Summer Summit, a research meeting where our graduate students presented posters. He was exposed to the scientific literature, participated in the planning and performance of experiments, and made significant progress in the evaluation of the results obtained. By the end of the summer, he was working extremely well with our specialized software programs and studying them in detail. He developed a very well structured final report, which will form the basis of a future research paper. The results obtained were somewhat surprising and will have a strong impact on our future research. This summer has been one my best, it was the renewal that I have always dreamed thanks to the team that we have developed. This summer has been successful thanks to graduate student Barbara Alvarado who served as the pre faculty mentor to Jacob and also thanks to Adriluz Sánchez, Carlos Ortega and Eduardo Hernández, graduate students who also worked with Jacob throughout the summer. Dr. Carlos Pinzón our new postdoctoral research associate also contributed, and Dr. Rafael Méndez served as Jacob’s mentor and suggested key experiments that made a big difference. We were able to advance research, meet several times to discuss important research papers, and I was also able to make two presentations at the World Conference on Sampling and Blending in Bordeaux, enjoy some vacation time with my family, and two manuscripts were submitted for publication. Research culture is how researchers feel and see the uniqueness of their research environment. If after listening to the President or Chancellor speak about the importance of research, two researchers say: “Wonderful speech and plans, but the reality in Mayagüez is …..”, they are describing our research culture. Research culture starts within our research groups and students, and developing a strong community around a group project can be very productive. I hope this summary is useful to new professors starting research groups within our Campus and University.